I decided to write F and share my thoughts and what his act has triggered in me.I can share openly my process and what this had done to me – and I can share the beauty I have seen in him. And it feels GOOD to do that. That it feels good means that it comes from the heart and truth, and I am committed to follow impulses/guiding from that source. That is the very essence of healing – to follow those impulses, and disregard the fear-based ones, belonging to the false self. I see more often now that any feelings of discomfort, fear, pain come from choosing the ego thought system of guilt, sin and fear and believing it is “mine” – identifying with it – but I can choose to turn away from the ego-lies and listen to Love instead. My beloved Jamie tells me that this is all we have to do as Course students: just acknowledge that we chose this, we don’t want this any longer, and leave the rest to Holy Spirit. I used a couple of hours this night to write down in a frank letter to him what was triggered in me by his act of destruction. The more I wrote, the more love was felt – and the clearer I saw and remembered him from when he was my patient: a deeply sensitive and creative man with torturing inner voices. And again I remembered that it was in our work together that an important truth was found – the Divine is always available in the middle of chaos and can be summoned. Yesterday I realized that Fred (the stone-thrower) and I have a soul-agreement this life: that we would end this pattern of projections and roles between us. – He has got “the big bad wolf”-role and I am the grandmother who is eaten :-). AS I “saw” this, I saw in my inner eye that Fred was taken out of the attack-trance – deep peace enveloped him, he quite lost his ferociousness. I told this to Kit today in our sharing-session – and also shared that I will not report him to the police – since that would NOT bring healing to the fear-complex: I would only fear the moment he came out again – just postponing the agony. Much better to use the situation for healing. What is important for me is that I am able to see through the fear and find the gift inside this whole process – symbolized by the wonderful glass heart. We are both part of a healing awakening-process : when he threw that stone, he broke through a story of denial – my denial of my own rage. It felt very liberating to get in touch with that primordial rage, and not take it personal. I want to write him a handwritten letter…telling about the glass-heart, and how I see that as a sign of Love: we can trust that this relationship between us can be used for Truth and Love for both. Now it is seen so clearly that we have just played out roles in a classic story – but the roles say nothing about who we ARE in reality. And I see that what I really want – and what makes me feel so peaceful when thinking about it – is suggesting that we might have a phone or Skype-conversation where we both speak and listen to each other in segments of 5 minutes each: when A speaks, B listens and reflects back what s/he hears. To report him to the police now would cheat me of that gift – and it may also tip him over into deep thoughts of revenge. Truth is not helped by it. I remember a wonderful session we had. One of many where the Divine Feminine became present. He was painting a picture of a vortex of dark feelings, and inside was an empty space. When I asked what wanted to be painted there, he quickly painted a yin/yang sign. And outside this a blue slender and tender figure appeared: Mother Mary. She told him that whenever he is plagued by dark moods, he needs to recognize that she is there at the same time – and that he can choose to put his focus on her and not the chaos. It IS the only sane choice there is – but in order to take it, we need to realize that the chaos/terror/pain-stuff – however strongly it manifests – is not real, and the thoughts about it do not tell the truth. This morning, the moment there is a belief in the old story of being attacked, the tremendous pain starts in the heart. I am aware that this moment I do not even ask for help – there is no God available where I seem to be. And all the same, the tipping point may have been reached. The miracle comes: gentle thoughts from Love are noticed, in the middle of crazythoughts. I recognize that even though the effects/symptoms are overwhelming, there is also a willingness to deny the reality of these projections of guilt from the mind. The Voice had been able to be heard because the willingness to see past the symptoms to Love was present. I talked to a policeman Friday about coming here today, and was told to call back this morning and set up time. I realized that doing that started a whole avalanche of expectations and speculations of what they MIGHT discover – and I saw that this influence was not healing for me: it created more paranoia, and they could find evidence that confirmed that. It was seen that what I needed to strengthen, was the trust and support in Love inside my mind, and not looking for and finding proofs for insane attacks in the outside world. The first insight this morning was that I did not have to call the police today. 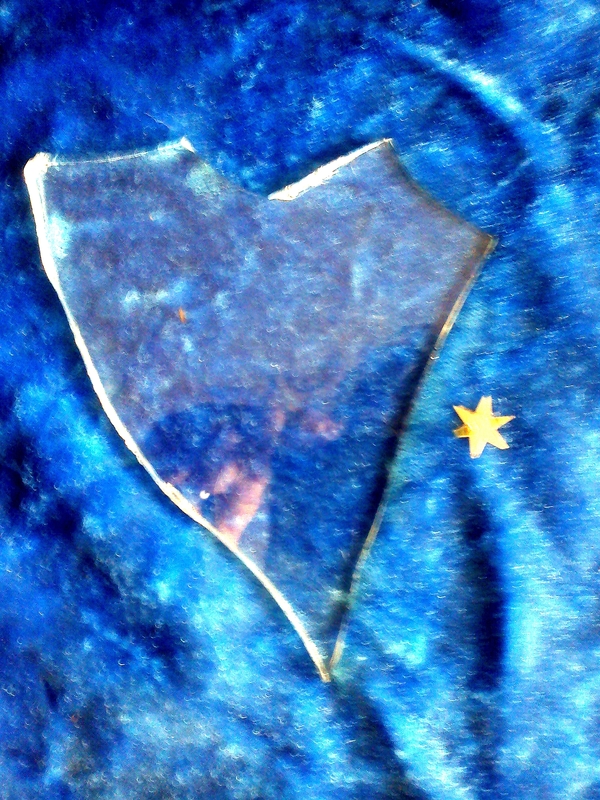 Then I was reminded of the heart of glass that manifested in the middle of the destruction: a beautiful symbol not to be missed. “That heart could not have been manifested if you did not trust Love to be Truth” said Blue. I truly see how everything happens through me and not to me. I chose with Barb recently to notice that not calling the Police created peace inside. I realized that I already had chosen that. When the fear-thoughts this morning came and started to doubt my former decision – that was when the attack was felt the most acutely. This is an old pattern in the mind of humanity: to doubt one’s decision for peace. That doubt – given support and confidence – creates huge chaos in the mind: it gives a signal to deny truth and choose fear. No wonder this manifests so strongly in my body! The willingness to see Love instead of fear is now seen to have brought fruits. “If I don’t do take the “right” choice NOW I will never have another chance.” Meaning – I HAVE TO do the one right thing now ( like calling the police) or disaster will happen – and it will bring calamities on the whole world. And the pressure to HAVE TO find “the (ego)right thing….impossible. What a great way to block the gentle Voice of Truth. 1 Denying fear as real doe NOT mean that I deny that I feel it – I just deny the stories it tells. *The Course teaches that it is the Son of God as Mind, outside time and space, who chooses each moment which teacher to listen to: Love – or ego. Another nocturnal session with Barb…I found a part that thought it was safe to choose agony, safe to choose terror! Barb said: “but you don’t have to believe that.” And it felt T E R R O R at hearing that – because it believed its job was to choose terror and agony as its friends. I can dare to believe what I know – that God is present whether I doubt or fear or believe in terror or not: nothing has happened except in my mind. If perceptions are not aligned with truth, don’t believe them. Ask “Is this truth?” How do I know this perception is true? Some week ago I opened the doc where I have saved this blog as a doc. All the titles were gone from the navigation-menu to the left. Whatever I did could not bring them back. I swore just a little – and as I reformatted all the titles in 16 point bold Times, one by one since 2010 I found myself starting to read some of them. I highlighted the pearls, aiding me in the post-traumatic stress-period after the stone through the window. And discovered what a great gift it was that I had to do that re-formatting. (About the stone-fears:)It became so clear how the story is nothing, and how my belief in it gives it all the meaning – and power – it has for me. It became clear how much I held on to it. And what has been the hook is the belief that it can kill me if I let it go. Suddenly I felt a giggle – and a willingness to be wrong about that belief. Holy Spirit took it, and now I know: This cold/hate/anger/fear cannot kill me: it is just a story. Someplace in the dream, there is a really icky dark poisonous energy. I state my willingness to release the belief that ego can block Love – and after some seconds I have the thought that this is the very substance of the veil of illusion, that warps our perception – described above in the Course-quote. Blue says: “If God is perfect Love, this is a dream.” It’s just stuff. Not a signal of some hidden guilt or dangerous personal memory. I am starting to be excited to know that Heaven is just beyond this veil. It is just a habit that I call me. I can only let it go now when I see that I choose it. And in the night, Blue spoke so soft and sweet to me: reminding me that each time I had a memory and felt its nauseating impact on the nervous system -I could remind myself that this was nothing I had to fix, by “forgiving it so it should go away” – I understood, in a melting moment, that all that was required, was silently looking at it. As I allow the truth permeate me – that if God is perfect Love, anything else must be illusion – the strong sensations of panic abate. I got the “message” that all was taken care of between us, whatever happened later was just part of the dream/the script – not to be taken seriously.